Do you own or work in a freestanding birth center in California? Does it have a license? Do you want to get it licensed? CALM legal counsel Susan Jenkins, JD, has been working to clarify and facilitate the process of licensure for California birth centers. Read on for her update and next steps. Important: If you are a birth center owner or administrator, please be sure to check out the survey at the end of this post. The great majority of birth centers in California are unlicensed, legally operated under the exempt-from-licensure status provided by sections 1204.3 and 1206 of the CA Health & Safety Code. Licensure carries benefits and drawbacks. Fortunately, California law allows you to decide. The California Association of Licensed Midwives (CALM) supports its members in either choice. Recently, several CALM members have indicated their interest in seeking licensure for their presently-exempt birth centers or getting a license to open a new birth center. If you are interested in exploring this option, read on, because CALM is reaching out to its members who own or practice in birth centers. We are also exploring a membership model that would include a birth center division. 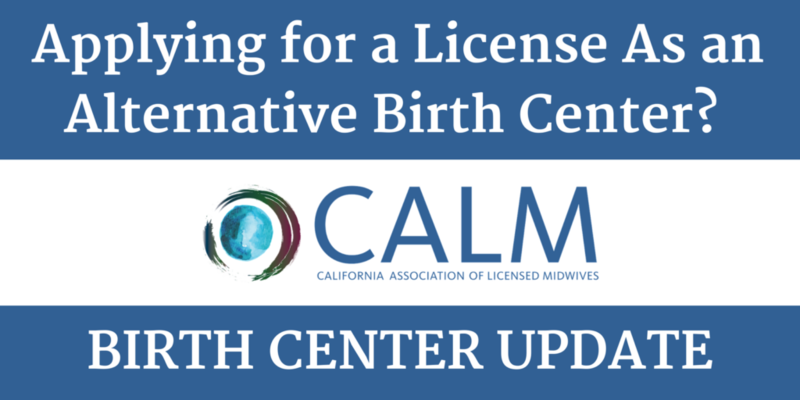 Last year, CALM intervened successfully to protect the legally-exempt status of midwife-owned birth centers when we learned that some members were at risk of being shut down by the California Department of Public Health (“CDPH”), the agency that issues licenses. In this alert, we are providing an update on developments since last year and, for those who are interested, discussing the path to licensure. You may recall from the October 2016 CALM Birth Center Alert that some confused CDPH employees tried to shut down an unlicensed birth center last year. We were able to quickly intervene with CDPH officials to stop the process and convince them that California law permits a licensed midwife to provide intrapartum birth services in the premises she uses as her professional office without having to get a license for the office as a birth center. The unlicensed site may legally function as a freestanding birth center (FSBC) and may use the term “birth center” in its name, so long as it does not claim to be a licensed “Alternative Birth Center.” That term is reserved by the law for licensed birth centers. The intent of the law is to recognize that midwives’ scope of practice does not vary between home or birth center, so regulation is focused on the midwife, not the site. The prohibition on calling one’s birth center a licensed ABC is a truth-in-advertising rule, intended to protect consumers. So long as you do not claim that your birth center is a licensed “ABC,” you may refer to it as a “birth center,” advertise it as a “birth center,” or use the term “birth center” in its name. We explained this as CALM’s legal position for its members to CDPH last year and, after doing their own research, their lawyers agreed with ours. In November 2016, CDPH officials acknowledged that our interpretation was correct and agreed to take no action against any exempt birth center. CALM Intervention with CDPH in 2017. Earlier this year, CALM followed up with the Licensing and Certification section of the Center for Health Care Quality (CHCQ), the division of CDPH that regulates health facilities. Our consulting attorney has opened a friendly dialogue with Andy Barbusca, the Chief of CHCQ. Several months ago, Mr. Barbusca asked us to delay filing license application for a short while because CDPH was in the process of replacing its county-office-based paper application process with a centralized online application system for all initial facility licenses. All facility license applications will now be handled online through the Central Application Unit (“CAU”), headquartered in Sacramento. As of late August, the CAU was still not ready to process ABC applications online. Since then, CDPH has revised its website for health care facilities, which can be accessed here. This page contains a link to a list of interactive facility application forms but, unfortunately, CHCQ has not yet developed an application form for ABCs. The web page simply instructs applicants whose facility category is not listed to send an email to the agency. Please do not do this. Wait just a little longer. When we asked Mr. Barbusco about this gap, he said it should be corrected in the near future and asked me to wait to hear from him before anyone tries to apply. I will continue to follow up with him and issue a future Alert when we have further instructions. The statutory and regulatory requirements for birth center licensure are poorly drafted and subject to misinterpretation. Our consulting attorney is concerned that CHCQ personnel may have misinterpreted the law and rules regarding license qualifications in the past, and wants to ensure that CHCQ will interpret those provisions in a reasonable manner. While those negotiations take place, CALM can offer members a group process to get educated and work on their applications cooperatively with other CALM birth center owners. Mr. Barbusco and I agree on how the legal qualifications for licensure should be interpreted and implemented. The CA Health & Safety Code, section 1204(b) clarifies that an ABC is considered a type of “specialty clinic,” subject to specialty clinic rules, NOT a primary care clinic. So, first point: do not allow CDPH personnel to try to classify or treat your center as a primary care ABC or clinic, or apply primary care ABC rules. Some already licensed birth centers made this mistake. (5) have a written policy regarding child passenger restraints. (6) pay the licensure application fee which, for ABCs, is $2,737.22. This is also the annual renewal fee. What do these mean? How to satisfy them? Quality Assurance Program. The law doesn’t define or specify any details on this, so you can craft your own; this is a reasonable requirement that we won’t dispute. The proper interpretation of this law is that ABCs do NOT have to be certified (or accredited) in order to qualify for licensure. The law mistakenly uses the concept of certification, which relates to health professionals not facilities, and references AABC, which is a trade association not a certification or accreditation entity (a separate organization, CABC, handles accreditation). CDPH lacks statutory authority to require ABC candidates to become accredited. Simply meeting AABC’s Standards, however, should not be a problem. AABC’s 2013 Standards allow birth centers to substitute written policies as an alternative to restrictive requirements like physician or hospital agreements. 30 minutes distance from a hospital: this should not pose a problem in urban areas but may be an issue in rural communities. Waivers or rules modification may be needed. Written policy on child passenger restraints. This shouldn’t be a problem either. Hospitals must do this also. There are specifics on what the policy should include, listed on the CHCQ/Licensing & Certification website and also on the CPSP website to use as your model. We will supplement this memo to discuss the regulations regarding building and fire safety codes in the next CALM Birth Center Alert. Are you a birth center owner or administrator? We have had a great response from our California Birth Center survey. However, if you have not completed it yet, we want to hear from you! Click here to complete our short survey. (1) Federal Medicaid law requires freestanding birth centers (FSBCs”) to be licensed (or otherwise approved by a state agency) in order for the birth center to bill the state Medicaid program (in California, Medi-cal) for facility-related services. California has adopted this federal provision. This is a link to Medi-Cal facility codes that are reimbursable to ABCs. (2) Licensed ABCs are also CPS providers, so can bill Medi-Cal for CPSP ABC services; also, LMs working in licensed ABCs can be billed as CPS practitioners (LMs will be CPS Providers once we fix the law/rule problem with MBC). NOTE: only CPS Providers can bill for CPSP services. (3) Medi-Cal payment for licensed FSBCs services is mandated by federal law. All Medi-Cal managed care plans are required by federal law to pay for FSBC facility-related services, including use of the facility. This mandate extends to the professional services provided by licensed midwives who work in birth centers. This is an indirect way to achieve the federal mandate for CPM services that The MAMA Campaign has been lobbying for since 2009. DHCS, the Medi-Cal agency, has already told its managed care plans that they must cover licensed ABCs, and CNMs who work in licensed ABCs. DHCS would have to extend this requirement to LMs in birth centers if licensed. (4) The ACA law requires ALL health care plans in the insurance exchanges, as well as many employer-based plans, to not discriminate against any category of licensed health care providers. This includes both LMs and FSBCs, but the FSBCs would have to be licensed as ABCs to qualify as a provider under this law. In general, however, private health plans and managed care plans are likely to insist on licensed status for any facility that would be added to the plan’s provider network. (5) Legislators (Democrats in particular)) are likely to view health care provider licensing as a consumer protection issue. To the extent that we might seek legislation to benefit FSBCs, legislators may expect that they be licensed. (6) Public relations and the media: public expectation is generally that health care facilities would be licensed. (2) Malpractice insurance, while not required for licensing, is required for managed care plan network participation. This requirement is probably too much embedded in the system to be successfully challenged. (3) Expenses of initial compliance, in terms of renovations to meet building code and fire code standards. (4) Compliance with government rules, and putting up with agency inspections, usually unscheduled. Dealing with the CDPH bureaucracy. (5) Need to comply with Medi-Cal provisions of the law: 50% of clients must be Medi-Cal and must be a CPS provider.